Enhancing your home’s curb appeal; fresh mulch and a little landscaping make that first impression great. Rent a storage unit and declutter. Less is more when showing a house. Spend the money and get an inspection so you know what is going on under the hood. Hire a maid to do a onetime deep cleaning; dirty bathrooms and kitchens are definite deal killers. Buy new lightbulbs, make sure the wattage and shape are consitent throught youerhouse. You will want to read Kevin Hogan's Initial Review and Highest Priority for Selling Your Home before you put your home on the market. A certified expert at staging homes for quick sale at top dollar, Kevin knows what simple fixes can bring upto a 700% return on the money invested in minor repairs and upgrades. Along with Paul and everyone at The Paul Gillespie & Associates, Kevin has developed a powerful marketing strategy, Maximum Exposure Marketing, that is proven to bring buyers to your door. 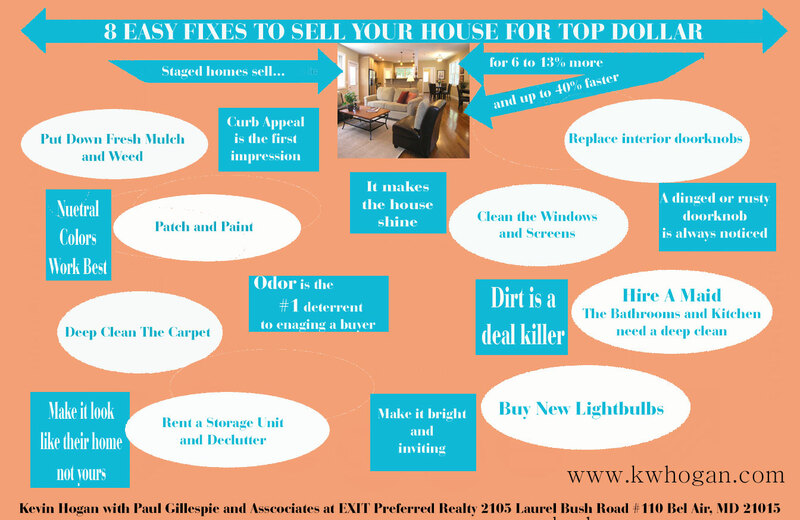 Call 443-536-9966 or email kevinwaltonhogan@hotmail.com today and get the most from your house. Call Kevin Hogan at 443-536-9966, a Customer First, RESE, OwnAmerica Investor Certified, USDA Loan Property and FHA 203k Loan Agent specializing in communities in and around the Carroll County area such as Eldersburg, Sykesville, Mt. Airy, Woodbine and Hampstead.